Life at Seymour Dental is moving at a quick pace and we are constantly learning new skills. 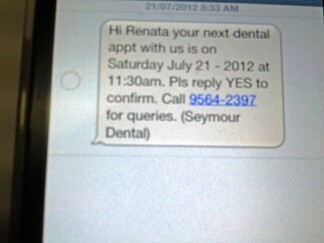 Recently we had a new program installed on our computers which enables us to SMS our patients to confirm their appointments. 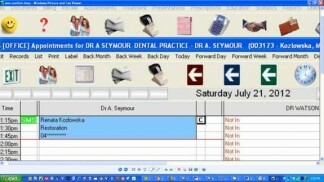 The only draw back is that the patients need to SMS back “YES”, to show on our screen that they can attend their appointment. Sometimes this doesn’t happen as they will write something else like “OK”, and then that doesn’t get transmitted to the appointment book automatically. We regularly check throughout the day the SMS log to make sure the patient has responded back. The set up is such that if the response is not “YES” then the person needs to call the surgery to organise another appointment or to cancel. We do require 24 hours notice so we can re-organise our day or find someone else who is waiting for an appointment. If the SMS does not work or people do not want to be reminded that way, we still use the “old fashioned” telephone and call people to confirm appointments. Talk or SMS you soon.